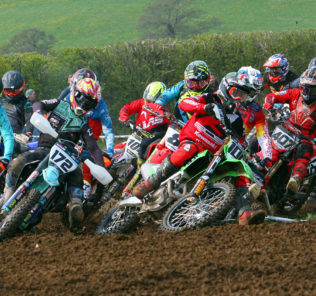 The South West Motocross Club opened their 2019 season with a Warm Up meeting at Littlehempston last Sunday and over 150 riders braved the cold and made for a great meeting. With a good number of new members, and with many riders moving up a group, these pre season meetings often throw up surprise results with new front runners emerging into the fray! The little Auto racers coped well with the conditions, and at the head of the field it was a battle royal between the top two of Walt Carroll and Jamie Currie. Currie started the day with the win in Moto 1, but Carroll fought back well and won the remaining Moto’s to take the overall. So it was Carroll then Currie, with James Stonier in third, one point ahead of Freddie Richards. Great effort guys! Three different riders tasted victory in the Junior 65cc class, Zane Sibley-Deakin taking first blood with the opening Moto win. Riley Small blasted back with the 1st place in the second race, while Phillip Tchorek improved as the day went on and went over the chequers first in the final moto. When the points were counted though it was Small with the Overall, from Tchorek in Second. Logan Chinock put in a good shift for third and Sibley-Deakin finished fourth. Harrison Roberts got his 2019 off to a flying start, going unbeaten in the three Small Wheel 85 motos for a convincing overall victory. Carter Brown was second in each race for the number two spot at the end of the day while Archie Hobbs finished a great third. In the Big Wheel 85’s Henry Life made a impressive transition from the Small Wheels with a solid three ride maximum and the overall. Behind Life though some of his main challengers suffered with DNF’s and with three consistent rides Jack Dando claimed the second step of the podium, with Ashton Coleman third. Another rider to move up in epic fashion was Jason Down, and he will be a force to be reckoned with this year in the Rookie class. Down won each and every moto for the overall from Brogan Laity in second and Brent Harris in third. The Adult B class was so stacked that they had to have an overflow class with the Vets. In the main Adult B race, Alex Loewy was the man to beat and after a second in Race one to Ben Masters, he pitched in with the remaining Moto wins for the overall. Tom Day would finish second, with Moto 1 victor Masters in third. Ryan Aiston proved unstoppable in the Overflow race with a clean sweep of wins. The Vets found the going tough and there was just one finisher from this class in the final race and that was Andrew Watkins, who as a result of this took the overall from David Ford, who was the winner in both of the first two races. Justin Carpenter would finish third. There was huge mismatch of results in the ultra competitive Adult A class with riders suffering from early season teething problems. Dominic Thomas though, managed to come through the day in good fettle and by winning the final moto, edged out Troy Jones for the win on countback. Just two points further back in third was Richard Tucker.